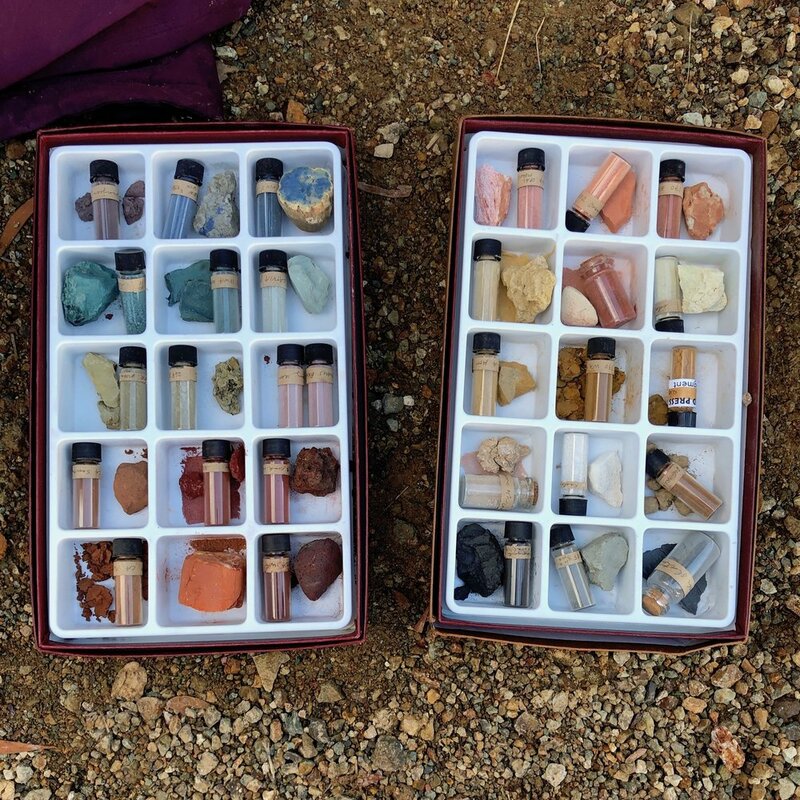 On Saturday, I joined Heidi Gustafson and a dozen others for an excursion into the Oakland hills to uncover local pigments. Over the course of the day, we hiked through a redwood-flanked trail, up a rain-swollen stream, over an area once mined for pyrite, among graffiti-decorated ruins, and along a ridge overlooking the San Francisco Bay. Aside from the magic of finding pigment just lying around on the ground (! ), the hike itself was a grand adventure. I saw an actual albino redwood, the ghost trees I was enthralled by after hearing the Science Solved It podcast about them. Little green blades and cotyledons were sprouting up everywhere after a week of rain. I pulled a tiny knob of gum from an acacia tree arching over the path. A few steps went through a perfume cloud of sage. And at several points, Heidi stopped to let everyone regroup as she shared interesting bits about history and geology. During the trek, Heidi shared information on Ohlone culture, ochre-based traditions, and the story of the area as everyone collected rocks for pigment-making. Along the hike, we looked for colorful rocks that had pigment potential. Bright yellow and red ochres stood out against the path and surrounding landscape; their crumbly texture differentiating them from the hard, gray angular stones around them. To help identify ochres, we swiped the rocks on a small bar of unglazed ceramic tile. The streak test shows a little stripe of the powdered mineral, revealing the color. Post-lunch, we went to a large rock formation that was rich with pigments—green serpentine, yellow goethite, and red hematite—for a final search. After dividing our collection into piles that were similarly colored or produced matching streak tests, small amounts of pigment were smashed with a mortar and pestle. I gathered an olive green, mustard yellow, and a range of reds: deep maroon, brighter sienna, and mauve rose. Others found peach, cream, browns, bluer shades of green, and more. 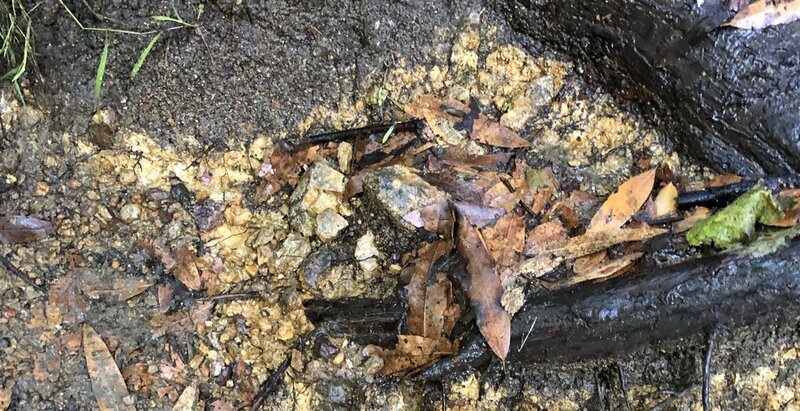 Some participants ground and tested other materials they had collected on the hike: white kaolin clay, red brick, and blue-black charcoal from a campfire. After pulverizing and sieving our rocks, we took a pigment group photo, documenting the hidden rainbow in our backyard. Back at the studio today, I ground the remaining serpentine into a powdery pigment, which Jessica mulled it into a beautiful, soft, celadon green watercolor paint. The handful of little rocks picked one by one from a cliff wall has been transformed into a delicate and romantic wash of color on paper. Heidi, describing herself as an ore whisperer, runs a research studio and ochre archive in Washington, where she collects, studies, and preserves iron oxides from around the world. Her extensive knowledge, ease with sharing that expertise, and reverence of the land makes apparent her deeply personal connection to her work. This was a day that I won’t forget. My sole regret is that—because I spent the day so deeply pensive, focused on not falling down on the trail, and engrossed in the materials at my feet—I didn’t get to learn more about the other artists and makers in the workshop. I am so thankful to have had the opportunity to gain new insight into art materials and the paintmaking process while immersed in nature.